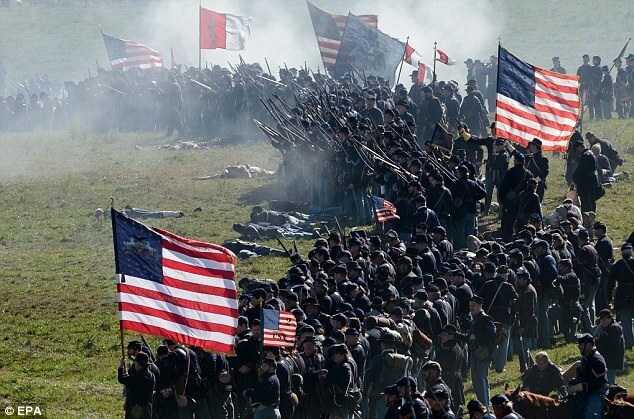 Confederate infantry reenactment (copyright: John Moore-Getty Images). On the night before the big showdown, there was a “singing battle” between the rival soldiers who were established in positions within a few hundred meters apart. Some Federals began to sing their ‘national’ folk songs “Hail Columbia” and especially the “Yankee Doodle”, and the Confederates answered immediately singing their own traditional songs “Dixie” and “The Bonnie Blue Flag”. Soon the two rival lines began to sing each one its own traditional song more and more loudly, in an almost unbearable squealing. Eventually a group of soldiers started to sing the nostalgic song “Home Sweet Home” for the home and the family that every soldier had left behind, which brought a “musical compromise” of the opponents. Soon, thousands of ‘Yankees’ and “Rebels” were singing simultaneously its nostalgic lyrics, as an informal peace, without knowing that in the next day they would clash in the second bloodiest battle of the Civil war, after the battle of Gettysburg. At dawn of December 31, Major General Hardee led the Confederate left wing and a strong cavalry force against the Federal right. The impetuous Southerners quickly outflanked their opponents who fell back towards the bank of Stones River. Thus Bragg surprised Rosecrans, forcing him to cancel his own envelopment maneuver. Around 7.00 am and under the pressure of the Confederate attack, Rosecrans recalled the division of his left wing which he intended to use for the maneuver. Its commander, Major General Thomas Crittenden, had crossed with his men the Stones in order to outflank the Confederate right wing under Major General John Breckinridge. Meanwhile, in the center of the two lines, the Union division of Major General Philip Sheridan and the Confederate Army corps of Major General Polk were clashing with unusual ferocity. The two rival army corpses were “familiar” to each other since the battle of Perryville, where they had clashed with the same determination. 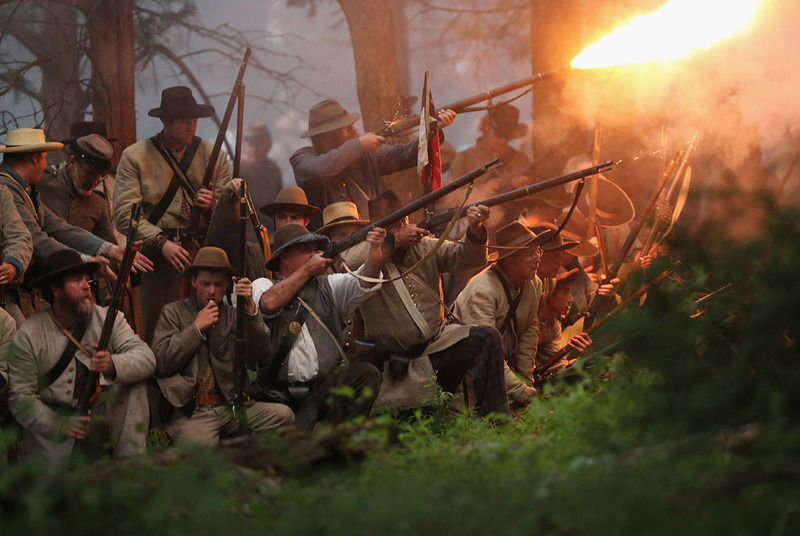 Union infantry reenactment (copyright: EPA). In July 1862, the skilful Confederate Commander in Chief in the West, General Beauregard, was assigned back to the Eastern Front, but President Davis did not define a replacement for his office. The Confederate president confined in assigning the thrice distinguished in the Mexican War, Major General Braxton Bragg, as general commander of the armies at the Tennessee-Mississippi front, who was from now on the unofficial Commander in Chief in the West. Braxton Bragg and his subordinates Major Generals Kirby Smith and Earl Van Dorn started to prepare the Confederate counterattack in order to recover the lost territories in the Western Front. Their distressed forces were reinforced and revived by the recent conscription. The general Confederate plans involved three synchronized campaigns in all the fronts from the Mississippi River to Virginia. In the East, General Robert Lee (the new commander of the Army of Northern Virginia) would invade Maryland. On the Western Front, the armies of Bragg and Smith would launch major offensives to Kentucky rushing from Chattanooga and Knoxville respectively (southeastern Tennessee). Simultaneously, Van Dorn would campaign from the Mississippi State against Grant’s army in western Tennessee. If he could manage to force back Grant’s army, he would then join Bragg and Smith somewhere in Kentucky. The ultimate aim of the Southerners was to encourage the (Southern after all) states of Maryland and Kentucky in leaving the Union and joining the Confederacy. Much depended on the speed of their march, the communications and the logistics. The success of the Confederate plan would also yield benefits on the diplomatic field because Britain and France would probably acknowledge the C.S.A. as a sovereign state – a much desired aim of the Richmond government. The French Emperor Napoleon III wanted to promote his plans on turning Mexico to a French dominion or semi-colony, but he would not officially acknowledge the Confederacy if the British did not do the same. However, the British were waiting patiently watching the progress of the war. The Irish Brigade at Gettysburg. A classic artwork by Don Troiani. 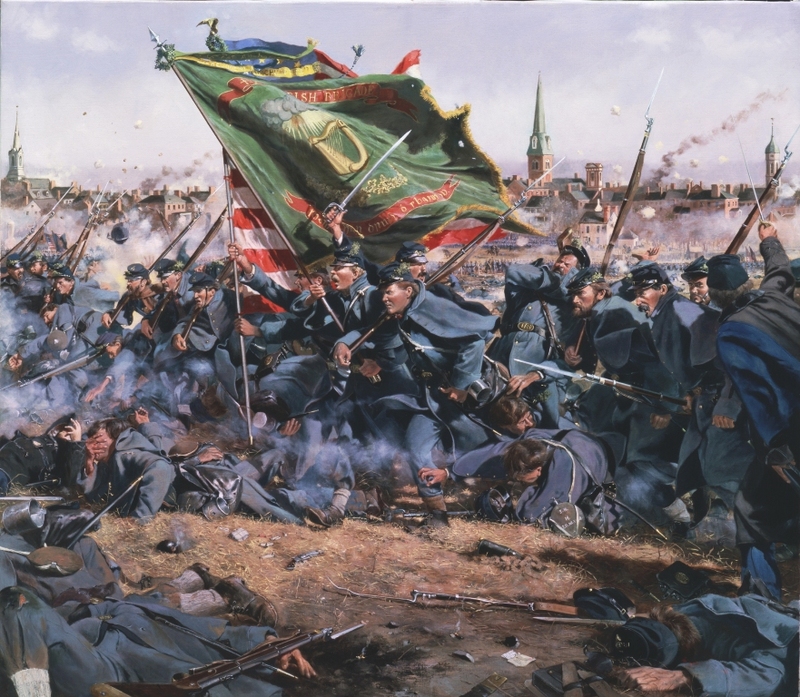 The Irish Infantry Brigade of the Federal Army (USA) in the Civil War consisted mainly of Irish immigrants and Americans of Irish descent, Catholics almost entirely. After the Civil War, the 69th Infantry Regiment of New York is considered to be the descendant unit of the Brigade (because its power was decreased because of the losses and the demobilization after the end of the war). Moreover, the 69th Regiment which goes on serving the U.S. Army was the original core of the Brigade. The Irish Brigade became famous for the high aggressiveness of its men and their characteristic Celtic battle cry ‘Fag an bealach!’ (‘Open the way!’, in Gaelic Celtic), typical of its risky missions. The Celts have always been renowned (already from Antiquity) for their bravery on the battlefield, being elite combatants (warriors and then soldiers) and renown mercenaries. On the other hand, the Celtic soldiers (expect possibly the Highlander Scots) were often considered to be expendable by the Anglo-Saxon political-military leaderships of the U.S. and Britain until the end of World War I. However, the heavy losses suffered generally by the Fed Irish soldiers during the Civil War were not always necessarily due to this mutual antipathy between Anglo-Saxons (‘natives’ as they called themselves) and Celts (usually newcomer immigrants), which in this period often ended in street clashes with several people dead in major American cities of the North like New York, Boston, Philadelphia etc. Their losses in the war were due to a significant extent, to the aforementioned martial reputation of the Celts: they used to undertake a major part of the fighting, thereby they had such heavy losses.